After several cards in a row that gently pushed us beyond doubts and fears, today we have one that tells us to take a break and consider your balance. Right in time for the weekend? Though I make a joke, not heeding the card can have serious repercussions, as it has for our society in general. Reading Points: You must be balanced and patient. The time is right to rest and contemplate all the facets of your existence. To continue now you must be still and calm. Finding the inner balance that will enable you to see beyond the present state is a process of trust and confidence in your own strengths. These facets may include the parts of your psyche that you would rather not deal with, but no amount of denial will rid you of the need to absorb and reclaim them. Balance is absolutely necessary to free the inner self from the fears and self-doubts that keep us spiritually deaf, dumb, and blind. Once the natural state of balance is achieved, the plateau that will give you access to the higher self will be open before you. Meaning: The balance between humanity and nature is vital. The intricate mechanisms that are the arteries and nervous system of the Earth are as sensitive and complex as that of any living organisms, and we have succeeded in shifting this delicate balance from one of finely tuned interactions to malignant and polluted environment. The ancient peoples of the Earth long ago recognized their dependence on the ecosystem of the planet to sustain and renew their children. Modern society has become completely detached from that reality and believes the planet is here only for our selfish and greedy consumption. The renewal is taken for granted, yet we have poured toxic waste into the seas and landscape so that our offspring will be facing death a thousand years from now. Our abuse of the natural world has annihilated whole species of creatures and rent a hole in the very fabric of the atmosphere that makes life on this planet possible. This is a crime beyond comprehension and humankind will be paying the price for generations to come. 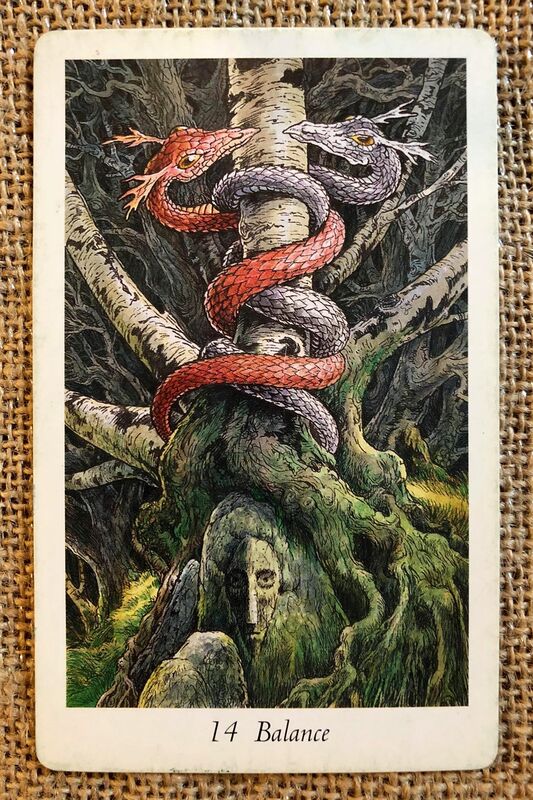 Temperance is the traditional name of this card, and it represents a state of inner strength and tranquility from which deeper knowledge of the self and universe can be absorbed and contemplated. It is the key to higher self. Both on the personal level and as a species, we must strive to find a balance.